Wildlife Photographer George Barnett. Over 200 of the Greatest Whitetail Images by this Nationally Known Photographer. Whitetail IMAGES: Up Close and Personal with whitetail photographer George Barnett features his greatest whitetail shots over a 20 year career. As you'll discover when you page through this book, Whitetail IMAGES: Up Close and Personal is far more than a collection of wildlife photographs. To be sure, the imagery of acclaimed whitetail photographer George Barnett is spectacular, and more than 250 of his finest shots are showcased here. You'll find photographs depicting glorious typicals, huge non-typicals, action shots, rut behavior, buck battles, and antler development. But that's not all you'll find. With typical candor and self-deprecating humor, Barnett shares his adventures and misadventures as a whitetail photographer. 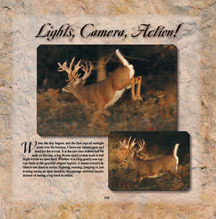 The photographer, author and yarn spinner also presents information about antler development and the life cycle of the whitetail and, uniquely, offers a wealth of tips for whitetail aficionados who would like to record their own memorable wildlife images. In fact, he uses his own work to show readers the difference between successful and unsuccessful images. With a winning combination of information, humor, photography tips, and "up close and personal" images, Barnett has created a fascinating book unlike any other. "The photographic genius of George Barnett has inspired, awed and entertained the white-tailed deer hunting aficionados of North America for more than two decades. Whitetail Images: Up Close and Personal is an appropriate showcase of George's personal fascination and dedication to his subject and getting the picture at all cost -- often risking life and limb in the process. In addition to his obvious photographic talents, George spices this masterpiece with his forte as a story teller, even if the story is sometimes at his expense. George’s photography has graced the covers and pages of every notable hunting publication in America and he has contributed more images to Buckmasters Whitetail Magazine than any other photographer since its inception 20 years ago". Printed in an 11" x 11" Coffee Table Format, each amazing picture was individually selected by George Barnett for inclusion in this outstanding book. These are the same high quality images that have been featured on hundreds of magazine covers, calendars and books which have displayed George Barnett's whitetai l images for nearly 20 years. Each page is accented with beautiful borders and textures, unlike any other coffee table book available today. 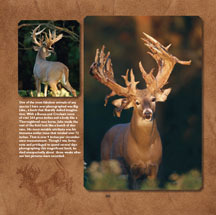 If you've enjoyed the Whitetail Super Bucks Calendar, you will love this collector's edition book. 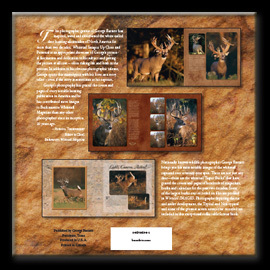 These are actual sample pages from the book detailing a few of the great whitetail images, graphics, as well as the use of stone, wood and leather as accents for each magnificent image. 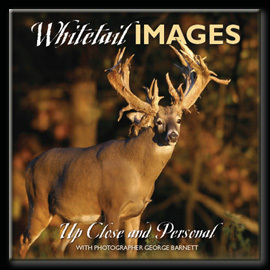 Whitetail IMAGES: Up Close and Personal with Photographer George Barnett is now available for purchase. The First Edition Run of this magnificent work will be limited to 5,000 copies. 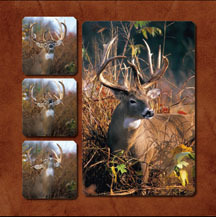 Include Whitetail IMAGES: Up Close and Personal with Photographer George Barnett on your list of must buy items for the Fall and upcoming Christmas season. Inquiries can be made by e-mailing George Barnett Photography. Please allow up to two weeks for delivery.